Everyone shares a love of food, but there are fewer that share the passion to cook! We know not everyone wants to hire cateres for their event as they would much rather have the pleasure of being the chef themselves! That’s where we can help by hiring one of our Hog Roasters. Feeding a mass amount of people and enjoying your party can be a hard task – but not with a Hog Roaster! Hog Roasting is a very simple process that has great taste and unbeatable flavours. You will be sure to leave your guests stunned after hiring a machine from us! We will you with the pig (or chosen meat) along with the gas so you are ready to go! With a few tips from our professionals you won’t be able to go wrong. People want great food at their events, and this increased awarenes within the British public suits us down to the ground. By offering abroad and exquisite range of hog and spit roast catered services, Spitting Pig Northwest has had the pleasure of serving stunning food to hundreds of events across the whole region. From wedding catering in Leigh, through to sports gatherings in Oldham – our food and services have delighted and crowds and given them really memorable experiences. Many people love having Maira, myself and members of our catering team at their parties and varied events to provide the hog and spit roast food; however, there are many whoo also love to give hog roasting a go themselves. As someone who simply loves to roast juicy hogs, I can completely see where they are coming from! 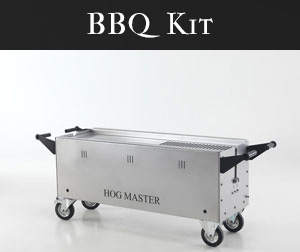 By hiring a hog roasting machine unit from us, you are one step closer to being involved in a process which not only yields the most wonderful meat which you can enjoy at any time of the day or night you choose, but also is such great fun to try. By manufacturing the machines ourselves in the factory premises in the North of England, we have complete and thorough knowledge of just what has gone into the design and construction of the machine units themselves. By adhering to the strictest guidelines when it comes to the manufacture of the machines (shown in the fact that all of our hog and spit roasters have a complete CE certification), we have absolute confidence in their easy and safe ability to roast a hog – even if you’ve never done it before. You literally place the hog in the roasting tray, turn the machine on and wait for the golden, crackly and very tasty result! What could be better? The hire of a machine from us is very straightforward, we event drop the machine off at your event premises and collect it afterwards. If that wasn’t enough, we even throw the gas in as well! We love the hog roast and we love taking part – now you can too with our fabulous hog roast machine hire option. When you come to us to buy or hire a hog roasting machine, know that you are making one of the best decisions that one can make in the world of hog roasting. 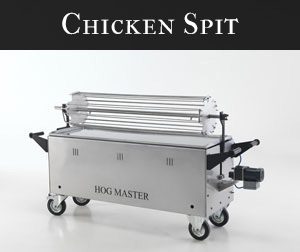 We sell the highest quality state of the art hog roasting machines. Our staff can take you through every function and aspect of our machines. You will be able to utilize every function. This will allow you to make the most of your roasting machine. You know that a company knows their machines when they are able to build them. Roasting a hog to perfection comes down to the quality of the machine you are cooking on along with the basic cooking knowledge. We make sure that every one of our machines complies with all environmental health requirements. We make sure that your meat will be cooked in nothing but the best of oven environments. If you feel like varying the type of meat you roast, or roaster will roast pretty much any animal that you desire to cook. 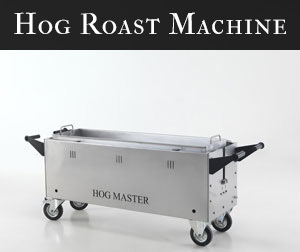 Our hog roast machines are versatile so that you get the most for your money. When you can use such a high quality machine for multiple purposes, you are saving a lot of time and money. Maybe you are not in the roasting mood. You don’t have to picture your roaster sitting unused. Our roasters are easily converted into grills for everyday backyard BBQs. Our machines will give you a lot of use between roasting and grilling. You will get your money’s worth! You will be able to utilize our roasting machines in a countless number of ways. Our machines really can be looked at as an investment. They can replace so many different types of cookers. Due to their tremendous quality, they are also built to last. You will not need to replace your machine for years to come. We take pride in the experience that our company has when it comes to hog roasting. We are also unstoppable in the knowledge of our machines and knowing what will be perfect for each unique customer who chooses to do business with our company. The hog and spit roasting event trade, for us, is a passion. We are very proud to be able to report that our growth is continuing strongly, though the use of superb ingredients, excellent flame-inspired spit roasting machines and overrall great service. Give us a call and we’ll give you a free quote for our Spitting Pig machines and pigs.